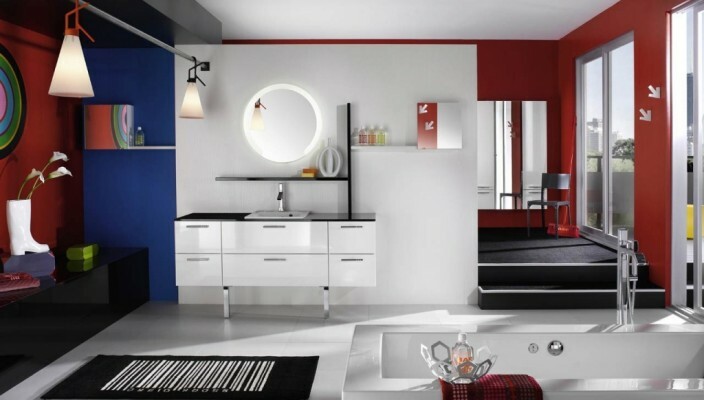 This bathroom concept is all about adding style in varied layers and colors to the modern interiors with a glossy finish for vanity and floor. This astounding and amazingly original bathroom concept is all about varied layers. The design features a clear glass countertop with the shelves designed in lacquer in white. A round mirror with illuminated effect has been used along with a vanity unit that comes in black countertop made of glass. The handles and the doors have a glossy finish that adds luxury value to the design. Overall, this bathroom idea balances the use of colors and retains the essential things that make it practical choice for all kinds of homes. Dreamy and functional, the design has all that’s needed for the right setting.